"There will be a substantial reward for the one who finds the Millennium Falcon. You are free to use any methods necessary, but I want them alive...."
This great photo has been signed by one of the actors who played one of the Bounty Hunters from the Star Wars galaxy - none other than Bossk. 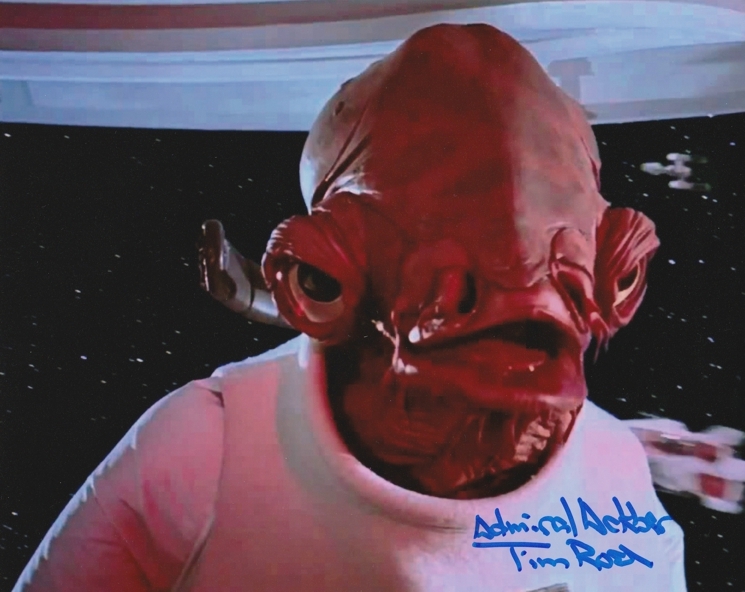 It has been signed by the man who played Bossk in The Empire Strikes Back, British actor Alan Harris. Alan signed this photo for us at a recent convention and we will provide you with photographic proof of him signing free of charge. Bounty hunters. 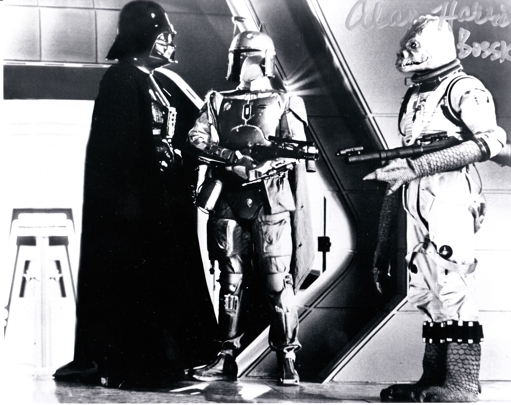 We don't need that scum," was a sentiment quietly expressed by Admiral Piett when Lord Vader recruited a group of six elite hunters to track down the Millennium Falcon. Piett thought he was out of earshot, but the disparagement was still heard by Bossk, a towering reptilian humanoid and skilled predator. Though Boba Fett ultimately bested the other hunters and collected Han Solo's bounty, Bossk is nonetheless a fearsome and heavily armed tracker. Relics from that era still exist, such as the battered chrome war droid known as IG-88. The tall, cylinder-headed and heavily-armed mechanical bounty hunter responded to Darth Vader's call to capture the Millennium Falcon during the events surrounding the Battle of Hoth.